The United States exported nearly 1.4 billion gallons of fuel ethanol in 2017, surpassing the previous record of 1.2 billion gallons set in 2011. U.S. imports of ethanol in 2017 increased compared with 2016 but remained relatively small at 77 million gallons, resulting in the United States being a net exporter of ethanol for the eighth consecutive year. The United States has seen continued growth in fuel ethanol exports over the past eight years as increases in both corn production and ethanol production capacity have outpaced domestic fuel ethanol consumption. U.S. fuel ethanol was exported to 35 countries in 2017, but more than half of all exported fuel ethanol went to Brazil and Canada. In the United States, ethanol is primarily used as a blending component in the production of motor gasoline and is mainly blended in volumes up to 10% ethanol, also known as E10. Corn is the primary feedstock of fuel ethanol in the United States, and large corn harvests and stable corn prices have contributed to increased fuel ethanol production in recent years. The U.S. Department of Agriculture estimates that the United States produced 14.6 billion bushels of corn in the 2017–2018 harvest year, 4% less than the record 2016–2017 harvest, but still the second-highest level in history. 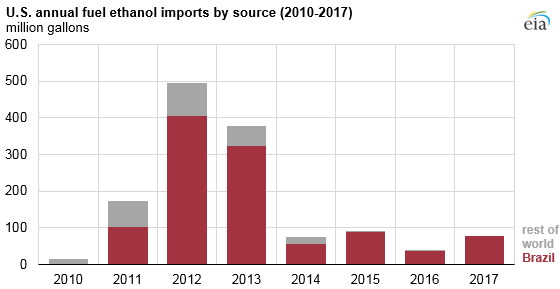 Fuel ethanol exports to Brazil increased for the fourth consecutive year, reaching 450 million gallons in 2017 and accounting for nearly one-third of all U.S. fuel ethanol exports. Like the United States, Brazil is one of the world’s largest producers and consumers of fuel ethanol, but the country has had supply issues in recent years. Fuel ethanol consumption in Brazil is driven largely by an ethanol blending mandate (currently set at 27%) and lower prices relative to gasoline, but Brazil's fuel ethanol prices are not competitive with fuel ethanol from the United States primarily because of higher agricultural feedstock costs, especially along Brazilian coastal areas. U.S. exports to Brazil reached 90 million gallons in the fourth quarter of 2017, despite Brazil’s introduction in September of a 20% tariff levied on U.S. fuel ethanol volumes of more than 150 million liters per quarter (roughly 40 million gallons). Canada remained the second-leading destination of U.S. fuel ethanol, receiving nearly 330 million gallons in 2017, 5% higher than the level exported in 2016. Canadian demand for U.S. fuel ethanol is driven by different ethanol mandates for gasoline across Canadian provinces, ranging from 5% in Alberta, British Columbia, and Ontario to as high as 8.5% in Manitoba. China was the third-leading destination for U.S. fuel ethanol in 2016, but U.S. exports to China fell by 88% in 2017, largely because of China's increase in the tariff on U.S. fuel ethanol from 5% to 30% at the start of 2017. This increase reversed the previous temporary reduction in the tariff to 5% in 2016 in response to new government biofuel initiatives. U.S. fuel ethanol imports in 2017—which were sourced entirely from Brazil—increased but remained relatively low at only 77 million gallons. U.S. fuel ethanol imports have been low in recent years because of relatively high domestic production along with the preference for biomass-based diesel over imported sugarcane ethanol to meet portions of renewable fuel programs such as the Renewable Fuel Standard and California’s Low Carbon Fuel Standard (LCFS). The limited amount of Brazilian sugarcane ethanol imported in 2017 was almost exclusively destined for California to meet LCFS gasoline targets.